Video is a great asset to any content marketing strategy. It allows you to engage your customers, provide information about your company or brand and position your employees as leaders in the industry. There are many myths video is difficult and expensive to produce. But it is actually very economical to create a simple business video. Here are the three stages of making a simple video. This is the planning process for your business video. In this time, you need to gather everything you will need for the video, including equipment, talent, a script and other assets you will use in the final production. At Kuno, we shoot our videos with a Canon T3i, but most cameras and even smartphones can record video in high definition, so find one that will fit your needs and budget. With the camera, you will also need a tripod to keep the camera steady and level, as a constantly moving camera is very distracting for your audience. Once you have the equipment, it is time to develop you script and find the talent. Your script should be short and concise but detailed enough to engage and educate your audience about your brand. A good tip is to take the key points out of a blog post and formulate them into a script. 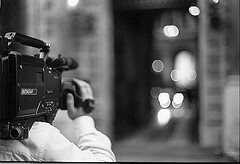 Your talent, or the person on camera, should be well spoken and knowledgeable about your company. Remember, this individual is speaking for your company, so you want him or her to sound confident and represent you well. Now that you have gathered everything you need for your video, it is time to shoot it. This process can take as little as a couple minutes and few takes to an hour (or longer) if your talent is having a little trouble in front of the camera. When you are shooting, it is good to keep in mind the environment should be relatively quiet and well lit. Proper lighting and recording are essential to a great video, as these elements are difficult to fix in post-production. A key point to remember is to take your time and record as much as you want. This will allow you to have multiple takes and shots to choose from in post-production. It is also a good idea to gather some supporting footage, or b-roll, to use for transitions and examples. Post-production is the final step in making your business video. This is where you are going to piece the different shots, assets and music into a finalized video. It is important to remember to use software that allows you to add not only video, but also transitions, images/graphics and text. This also doesn’t need to be expensive. There are great, fairly inexpensive editing programs, such as PowerDirector 11 Deluxe for Windows and iMovie for Macs. Both of these programs allow you to make professional style edits without paying the “professional” price. Now that you have learned how to develop a simple business video, please feel free to share your experiences, questions and, of course, links to your videos in the comments below. With a degree in Electronic Media, Dan Romanski has five years of video production, both professionally and independently. When he is not assisting with lead nurturing campaings and projects at Kuno, he can be found exploring different parts of Cleveland with his camera. Connect with him on LinkedIn.